Still More DC Comics 2008 Trade Paperbacks - Starman! Countdown! Couldn't hand off Collected Editions for November without just a few more trade paperback solicitations. And when we say few, we mean lots! Projected for May, June, and July 2008 from DC Comics, it's Countdown to Final Crisis volumes one and two! Starman: The Complete Saga! Justice League International volume two! The Green Lantern: No Fear paperback! Check it out! Starman: The Complete Saga hardcover volume 1 - WOW! World's Finest (deluxe edition) - the Dave Gibbons miniseres; well worth it! Batman: Jekyll & Hyde - Paul Jenkins miniseries. Preparing for The Dark Knight returns, anyone? Batman: Going Sane - Legends of the Dark Knight #65-68 by J. M. Dematteis. Dark Knight, eh? (For earlier DC Comics 2008 trade paperback solicitations, click here and here. And let me mention that there was one mini-series on this list to be collected, for which the first issue hasn't even come out, which I omitted because I like the writer a lot and felt this was something of a low blow. Though it's not as though anyone will be surprised to know this miniseries will eventually be collected -- have I taught you nothing? Let the speculation begin -- when I finally review the series, I'll name names). Can you (complete Starman) even (complete Starman) believe it? Now what are you going to buy? Wow that is one amazing list there. I am sure going to be busy! So what are the contents for the trades in this list and the links for the earlier lists? Gee, I don't know. 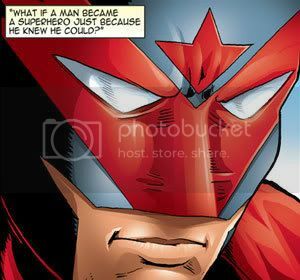 Should I maybe think about Complete Starman? Oh! There are too many interesting things to pick these months. May: Starman: The Complete Saga; Batman: The Resurrection of Ra's al Ghul; Superman: Escape from Bizarro World; Black Adam: The Dark Age; Batman: Joker's Last Laugh. June: Green Lantern: Tales of the Sinestro Corps hardcover; Green Lantern: The Sinestro Corps War volume 2; Batman: Jekyll & Hyde. July: Justice League International; Batman: Going Sane; Batman: Faces. Lots of good stuff on there. Provided that Complete Starman is not an Absolute edition (way too much money for those), I'm all over it. And, FINALLY, a Johns Green Lantern softcover...awesome. That's a long wait for Batman and Son trade. Say is that arc worth getting in hardcover? Any idea what's Ex Machina (deluxe edition)? Complete Starman sort of irks me; I'd rather have had Times Past II and not have to re-acquire the whole thing. Interesting that they didn't go with "The Greatest Legion of Super-Heroes Stories Ever Told", since it looks like it would fit into that line. JLI, Starman, Booster Gold, All new Atom, deluxe Ex Machina... my gawd, could you imagine how much money I'd have to spend if everything was as good?